Home › Forums › General Karting Discussion › Motor ID? This topic contains 5 replies, has 3 voices, and was last updated by Jeff Foust 4 years, 10 months ago. We picked up 2 karts with motors super cheap. Didn’t need them but couldn’t pass up a good deal. The owner said both karts were shipped over here from Germany and haven’t been run in some time (early 90’s or so). I don’t have pics of the other motor yet, but it was on a Mike Wilson MW5 with breadbox bodywork on it, and some kind of IAME motor. It looks similar to this one, but the head is round (and also black). The fins on the back of the cylinder appear to be broken, but they’re all uniformly broken like it was done intentionally. I literally unloaded the kart and didn’t look at it beyond getting this one pic. Back in the 80’s a buddy of mine had a 100cc Mac Minarelli. 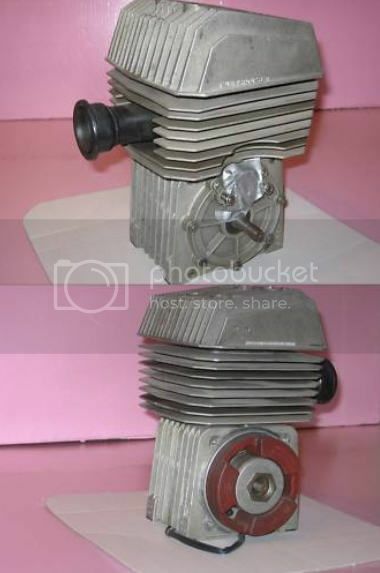 It was a rotary valve motor which looked very similar to the photo below although there were reed valve versions available too. His fins were black similar to your picture. The head seems to be turned in opposite directions between these two motors but it may not matter. I tried to get some pics last night but the kart is standing up on its back bumper and I didn’t really have time to set it down and get the motor removed for proper pics. Should get it done today. The other motor looks like a JICA to me.. It already got torn down so I don’t have pics of it. Will get some of that as well. Okay.. New pics! I found a few things in the process of popping it off the kart. The bottom of the motor on the drive side says Mac (perhaps Mac Minerelli? ), and the front says 330 (but that doesn’t seem to turn up much on ye olde Google). 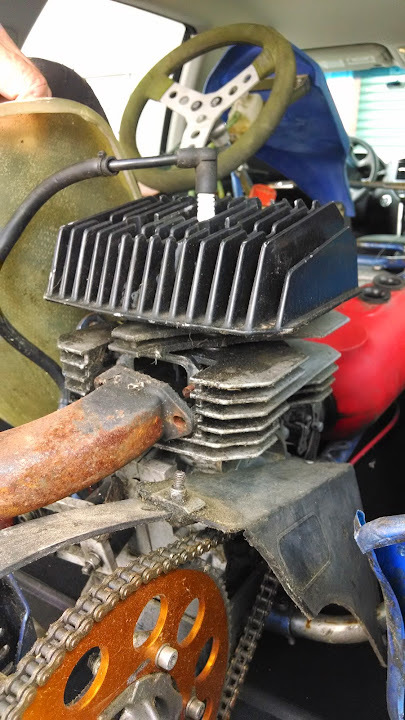 It’s a reed valve motor and the carb is a Tillotson HL-334A.